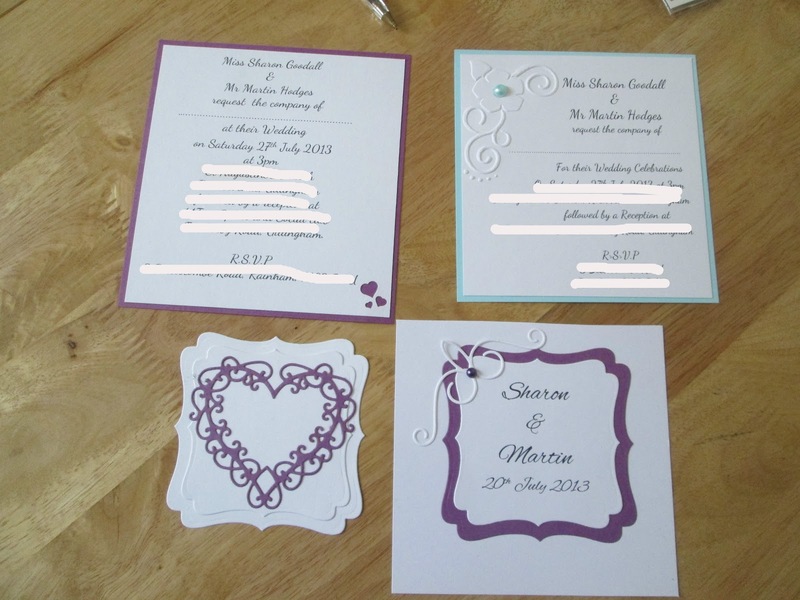 one happy little crafter: Invitations Update! I posted on here earlier in the week about making sample wedding invitations for my step-daughters wedding, thank you to everyone who replied to this, with some really helpful comments, I thought i'd share with you all what I've come up with..........thank God for dies and embossing folders!!!! They have chosen the one in the top photo that is embossed and has pink gems, although this are going to be replaced by purple pearls to fit in with the colour scheme, apparently they were delighted with all the options.......and this might lead to a commision for another friends wedding. Thanks again for your help....you're the best! These are stunning Lisa. I love the elegant designs. It looks like you are going to be very busy!! Hi Lisa, You did great! I saw your post and couldn't help you with ideas but i see you worked it out! They chose a nice one! a bit of a dusty one! The one that was very white! The one where the Cutie Pies got loved up! Yehaaawww...or words to that effect!